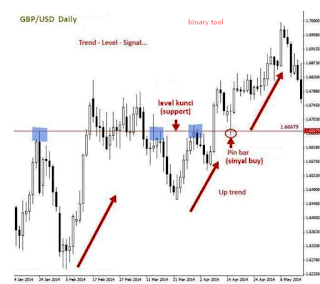 Entry is very important and determines the final outcome in forex trading. The measured and efficient entry method will determine the success of trading in the long run. However, many traders consider entry to be an easy thing to do and do not look for the best possible entry to get optimal trading results. A limit order is a pending order that is determined above or below the current market price depending on the direction of the trade you are making. If you are trading long (will open a buy position) then you can open a buy limit entry below the current market price, and if the price moves down to the level of entry you want then the buy order will be executed. Conversely if you are trading short (will open a sell position) then you can open a sell entry limit above the current market price. If the price moves up to the level of entry you want then sell orders will be executed. In addition to limit orders, other options for pending orders are stop orders, namely stop buy orders and stop sell orders. If you are trading long, you can open a stop buy entry above the current market price, and if the price moves up to the level of entry you want then sell orders will be executed, and vice versa to stop sell orders. However, from the experience of traders, stop orders often occur slippage or price jumps, so you can get more expensive prices when buying and lower prices when selling. Slippage usually occurs when market volatility is high and only at stop orders (stop buy or stop sell), therefore traders prefer limit orders when using pending order facilities. A limit order allows you to get an accurate entry price as desired. One method that is often used is the entry limit order at the 50% retracement of the trading signal (eg pin bar) because the probability of forwarding the trend at that level is usually high, so you can place a stop level with the smallest possible distance to get high risk / reward ratio. Forex traders assume the closing price is the price when the New York market closes. At that time only the new Zealand market began to open and trading volume was relatively very low. To avoid market noise, you can analyze and setup around that time, determine important resistance and support levels, see possible trading signals and predict price movement trends the next day. For analysis it is recommended to use a daily time frame. On the daily XAG / USD chart above, the trend is clearly bearish, and the rejection pin bar formed at the important resistance level (key level) is a signal to sell. The highest pin bar level is around 50% of the retracement of the previous downtrend movement. TLS configuration has been fulfilled, and we can enter after a pin bar signal or with a pending order sell limit at the 50% retracement level when the price starts to retrace upward. Make a checklist to determine entry criteria, such as important support or resistance levels, trading signals with high probability, estimated entry level, risk / reward ratio and others. This checklist is also for evaluating trading results as a reference or to be corrected for the next trade. A checklist is needed to make it easier to recognize the characteristics of the movements of the currency pairs you are trading.